Learn Greek via Skype is Top 15 on the Web! 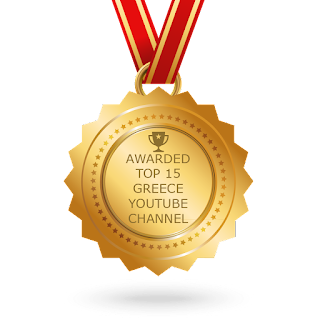 I am so honoured and grateful to announce that "Learn Greek via Talking" has made it into the Top 15 Greece YouTube Channels on the web!! My personal thanks and deep appreciation to all people who supported and enjoyed my videos! Follow Tatiana's board Films for A2 Level on Pinterest. Follow Tatiana's board FIlms for Β1, Γ1 levels ( home practice) on Pinterest. Follow Tatiana's board The Greek Alphabet and Double Letters on Pinterest. Tatiana is very friendly and an excellent teacher who is able to break down the almost incomprehensible and complex Greek grammar into bite sized manageable pieces which can then be easily learnt. If your goal is to learn to speak Greek as easily and quickly as possible without having to leave the comfort of your own home then I highly recommend you contact Tatiana. kostantina kavvadia. Picture Window theme. Powered by Blogger.